Treetopia designers strive to make new styles by creating distinctive and high quality artificial Christmas trees. They give customers trees that represent there own personality. Their products are from the widest selection of colorful and camera friendly Christmas trees. Treetopia trees have been featured at Good Morning America, Wendy Williams, HGTV and caught the eye of celebrity Rachael Ray. They offer a 2 - year warranty on lights and a 5 - year warranty on all non-clearance foliage. Their array of products are colorful trees, green trees, accessories, decorations, wreath & garlands. Treetopia has products on clearance and sale. You can find great Christmas clearance items and save up to 50% off. The 50% off ends soon, so don't miss out on the discount. To find out about Treetopia's latest products, clearance and sales. Follow them on Twitter and Like them on Facebook. Treetopia sent us their No. 2 Pencil Christmas Tree for review. I really like the way Treetopia packaged the tree, in the box. The tree came nicely covered in plastic to protected tree. I am very happy about that. Treetopia takes care of their customers. The green tree is 6' in height, 18' in width and multi color lit. 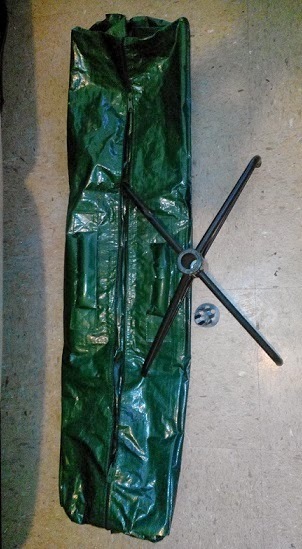 The tree comes in two pieces to attach together, a stand, bag and other accessory that's put underneath the stand and holds the tree in place. The No. 2 Pencil Christmas Tree doesn't take a lot of place and fits in any corner or place. My living room felt nice and peaceful with the tree. My kids and I love the tree and enjoyed decorating it. The tree looks so beautiful. We can't wait until November to start decorating it again. The tree fits our lifestyle. Treetopia's No. 2 Pencil Christmas Tree retails for $138. It's better to spend a little more. You know your getting great quality products to last for years and years. To view or buy a No. 2 Pencil Christmas Tree visit Treetopia. Find out what Christmas products Treetopia has, at http://www.treetopia.com. Oh, that's such a cute tree! I love getting things like Christmas trees and decorations off season on a discount. It's so nice just to open the boxes at Christmas and have everything ready - like an early Christmas present. That tree is decorated so prettily although I have never heard of a pencil tree. Great review! I've never heard of a pencil tree before, so my curiosity took me to their site.. I can't imagine having an upside down christmas tree! Nice decorations by the way! These Are Great Love Your Review Might Get Kids Are Getting Older!!! I really like these little slim trees, and they would work perfectly in our little downsized place. Thanks for reviewing.